More than 69,000 residents ages 60 and older call Cleveland home. The city (population: 390,000) joined the AARP Network of Age-Friendly Communities in September 2015 to demonstrate its commitment to enhancing the quality of life for older residents. The city's older adult population is diverse — just over half of residents age 65 and older identify as black or African American while 45.8 percent identify as white. An estimated 1.3 percent of residents are Asian while four percent of older adults in Cleveland report being of Hispanic or Latino heritage. About four out of 10 older people in Cleveland live alone, and the city's older residents are more likely than the national average to expect to stay in their homes as they age. A little over 20 percent of the city's residents over age 60 live in poverty. 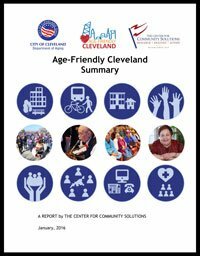 From April 2015 through January 2016 the Age-Friendly Cleveland Initiative collected feedback from more than 1,000 older adults as part of its assessment of the city's age-friendliness. The initiative facilitated focus group discussions, a comprehensive survey of a representative sample of older adult residents, and a shorter outreach questionnaire distributed by service providers and the Department of Aging. The evaluation focused on the eight domains of livability identified by the World Health Organization (WHO). The assessment report (downloadable here and at right) was prepared by The Center for Community Solutions, a nonprofit, nonpartisan think tank, along with staff members from the City of Cleveland Department of Aging. The assessment provides the foundation for an age-friendly action plan that will map out specific goals and milestones for evaluation. Almost half of participants in the assessment rated Cleveland as an excellent or good place for people to live as they age. The assessment uncovered a need for more information about available services, including details on the local 2‐1‐1 help center, available transportation supports, community events and mental health services. Residents will need additional resources to stay in their homes as they age, including services that provide assistance with snow removal and home maintenance, home delivered meals, and home health care services. Safety is a primary concern for many older residents. Innovative housing solutions and neighborhood supports — including more intergenerational housing, or shared housing arrangements — could be explored. Expanded chore services programs, visits from community members, and neighborhood safety networks were suggested as ways to alleviate housing‐related stress. A need exists to increase social participation, improve existing community resources such as parks and develop new programming specifically for older adults at libraries and recreation centers. Cleveland's older adults cite age-based discrimination as a challenge. Campaigns to reduce real or perceived hiring discrimination and highlight the benefits of hiring older adults could address this problem. The assessment found that increased access to preventive care and physical fitness opportunities for older adults at all income levels could help health disparities. Most of Cleveland's older residents say they've had a positive experience getting around the city, but increased flexibility in both routes and times, streamlined processes for accessing transportation supports, as well as improved outreach about existing services, could improve quality of life. The first 20 pages of the report provide a high-level summary of Cleveland's age-friendliness assessment with details for each of the eight domains. Among the most helpful portions of the full 160-page assessment are a profile of Cleveland's older adults (page 8), key findings of the assessment (page 32), and a review of the central themes and opportunities that emerged from the assessment (page 106). Appendices (beginning on page 100) offer additional details about the city's population and survey responses.